Thinking about the first tier cities in China, often Beijing and Shanghai are the first to come to mind. Often overlooked from a tourist’s standpoint, Guangzhou is one of the most important commercial centers of China and is becoming a first tier destination as evidenced by the plethora of luxurious five star hotels coming to this fascinating city. At the heart of the boom in the luxury market is The Ritz-Carlton, Guangzhou where east meets west, situated in the modern Pearl River New City in the Tianhe District. 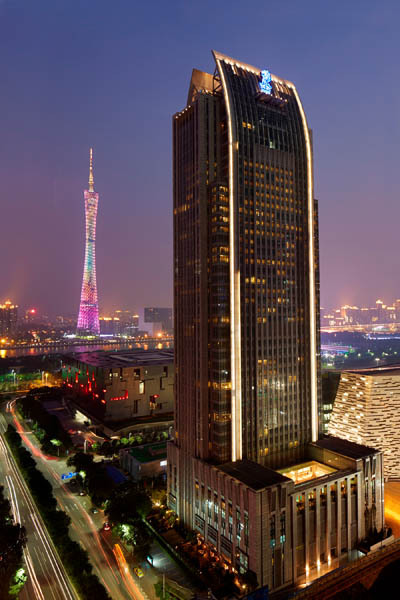 Nestled amongst some of Guangzhou’s most iconic and architecturally significant attractions, this five-star hotel is a hit among tourists and business travelers. Stepping foot into the Rococo-style lobby, guests are greeted with a cup of tea, which reflects Chinese traditions of hospitality. Besides accommodating some of the most luxurious hotel rooms, The Ritz-Carlton, Guangzhou features 91 serviced apartments, an exclusive offering amongst Guangzhou hotels. Hotel rooms offer gorgeous panoramic city views overlooking the Pearl River and the famous Canton Tower, Guangzhou’s equivalent of the Eiffel Tower, with its mesmerizing and colorful nightly light show. Designed for the discerning guests who want to pamper themselves in luxury while having the attention of a personal concierge, the elevated Club Experience sets The Ritz-Carlton apart from its other 5 star peers. Located on the upper levels of the hotel on the Club Floor, this hotel within a hotel features many special services and privileges. Guests can relax in the Club lounge that offers 270 degree panoramic views of the Pearl River and enjoy refined cuisine served throughout the day along with a complementary bar with fine wines and aged cordials in a luxurious setting. Known as the birthplace of Cantonese cuisine, the culinary legacy of Guangzhou is unparalleled. With fine dining proliferating through Guangzhou to satisfy the appetites of its sophisticated residents, the city has no shortage of top notch restaurants. Their flagship Haute Cantonese restaurant, Lai Heen has won numerous awards thanks to their talented chef who is ranked amongst the top chefs in China. For Western flavors dine at their Mediterranean gem, Limoni or have high tea with the sophisticated Pearl Lounge. Enjoy a game of pool along with live jazz and sip on rare whiskeys at the Churchill Bar that houses Guangzhou’s largest collection of single malt whiskeys along with a floor-to-ceiling cigar humidor. After a strenuous day of sightseeing, guests can escape the hustle and bustle of the city by stepping into the soothing spa. The tropical body massage involves a blend of citrus oil and de-aging body balm to ease tension in your neck and shoulder while the Swedish massage is a full body massage aimed to release knots and tension in the body. Pamper yourself with a hydrating deep moisture facial which uses ingredients such as jasmine, papaya, jojoba and shea butter to moisturize the skin and clove bud, lychee, rosewood and turmeric to smoothen fine lines and uneven texture. While moms are enjoying a day out at the spa and dads are busy at work, kids are taken care of at the Ritz Kids Program that welcomes kids of ages four to eight. Whether you’re alone on a business trip or visiting Guangzhou with your family, The Ritz-Carlton, Guangzhou successfully captures the essence of the city, bridging the gap between a need for a serene and tranquil vacation and a desire to explore.